Roger Patton is engineering manager for Pemserter Products at PennEngineering, Danboro, PA: tel. 215-766-8853, www.pemnet.com. Mechanical fasteners certainly have arrived as an attachment method of choice for sheetmetal assemblies, largely due to the many benefits the hardware can deliver before, during and after production. In the stamping industry, nuts and studs are common, and recent advances to in-die fastening technology have made an even stronger and more practical case for the use of mechanical fasteners. In-die fastening clearly can boost productivity when compared to other fastener-installation methods that require secondary operations. As with any operation, however, potential risks can loom—primarily loss of production or poor quality. The good news: Both of these potential problems with in-die fastening operations can readily be addressed and mitigated with proper troubleshooting techniques. Stampers dedicated to in-die fastener installation enjoy a reduction in labor and related costs. Combining the stamping operation with fastener insertion eliminates the need for secondary labor, which in most cases represents the bulk of the labor content related to fastening. Additional savings flow from reduced work in progress—in most cases, secondary operations run at a much slower pace than does stamping. Stampers run stockpiles of parts from the die, which then sit in queue waiting for fastener processing. Other process improvements realized from in-die fastening include faster throughput, less material handling, reduced scrap, and minimized floor-space requirements. Also, in virtually all cases, the investment required for an in-die system will be less than that for comparable secondary fastening equipment with similar capabilities. To optimize the productivity of an in-die fastening system, users should have a thorough understanding of potential problems and the vital role that troubleshooting can play in overcoming these problems and ensuring high equipment uptime. Troubleshooting in-die systems generally requires a metal stamper to investigate among four major areas: the fasteners, the feed system, the in-die tools (or insertion heads) and the control system. While fastener parameters such as material hardness and plating cannot be ignored, the dimensional characteristics of the fasteners usually are the most important parameters affecting proper operation of an in-die fastening system. As with all manufactured parts, fastener tolerances are critical—the in-die system must be able to accommodate the largest possible dimensions without allowing fasteners in the smallest dimensions to jam. This may seem straightforward, but operators must be prepared to consider stacked tolerances. Even if each individual feature on a fastener falls within tolerance, the stacking of the dimensions may produce a fastener outside the acceptable range. Metalformers can lose an excessive amount of time modifying system components such as feed rails and die tooling to accept a particular fastener size, only to discover later that the next lot of fasteners will not feed properly due to the modifications made. Users can eliminate this possibility by assessing the tolerances for the various features of the fastener while also determining the stacked tolerances of critical dimensions. This approach will reliably define the parameter in terms of what will and will not feed in the system. The dimensional characteristics of the fasteners usually are the most important parameters affecting proper operation of an in-die fastening system. As with all manufactured parts, fastener tolerances are critical—the in-die system must be able to accommodate the largest possible dimensions without allowing fasteners in the smallest dimensions to jam. Jamming typically results from dimensional changes to the fastener, as well as worn components such as feed rails and the shuttle. The most frequent problems involving feed systems are jamming, slow feed rates, and upside-down or misoriented fasteners. Jamming typically results from dimensional changes to the fastener, worn components such as feed rails and shuttles, or amplitude changes to the vibratory bowl or inline drives. Discover fastener dimensional changes and worn components using measurements and visual inspection. Amplitude changes can be more difficult to discern. The three factors metalformers should consider: the amount of fasteners staged in the bowl, voltage changes in the electrical supply, and changes to the amplitude settings. If too many or too few fasteners are staged in the bowl, the feed system may run too quickly or too slowly. The amount of fasteners is controlled by a hopper sensor, which sets the high/low limit for the amount in the bowl. A defective hopper sensor or a sensor set incorrectly will cause the bowl to run erratically. Voltage changes can produce a similar effect. Typically, voltage can fluctuate due to changes in the load on the electrical line. If other equipment or machines are on the same circuit, the voltage may be affected as the equipment cycles on and off, affecting amplitude. These settings are changed to compensate for one of the aforementioned conditions. While changing the settings can temporarily solve the problem, additional problems ultimately will occur. 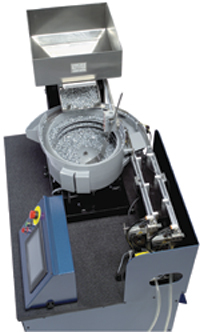 Feeder bowls are designed to run within a specified range and, when overfeeding, they will tend to jam. Slow feed rates can be caused by similar problems, but there are additional factors to consider. In pneumatically fed systems, blower time settings can affect feed rates. Here, the fasteners feed to the die individually as the press strokes. If blower times are excessive, less time may be available for fastener staging and the shuttle must wait for the blower time to end before the next fastener can be fed from the bowl. Although these types of systems generally are considered the most effective, care must be taken in setting blower times. 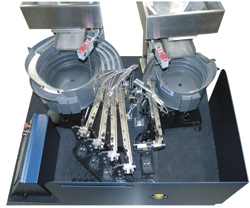 When set properly, metalformers can achieve feed rates in excess of 60 strokes/min. Broken bowl springs also may contribute to slow feed rates. These flat, hardened springs usually break at their attachment points and the cracks can be difficult to detect. Operators should inspect the springs carefully for fatigue cracks, and may need to remove the springs for a thorough inspection. A properly designed and maintained system should not result in upside-down or misoriented fasteners. At minimum, however, each feed track should contain a feature to prevent incorrectly oriented fasteners from passing to the die. The usual causes of misoriented fasteners are worn or missing tooling from the feed system, or dimensionally incorrect fasteners. If the tooling features are worn or have been removed, upside-down fasteners may, unfortunately, be fed, especially in the case of clinch nuts, where little difference exists between the fastener’s top and bottom. Problems with the in-die tool usually result in fastener-positioning problems, poor clinch performance or damaged asteners. Typical culprits are substandard fasteners, tool damage or wear, misalignment of insertion tools and stock strip positioning. If tool-related problems arise, begin the troubleshooting mission by verifying the quality of the fasteners, since fasteners are guided either by their external or internal features, depending on fastener type. If the fasteners fall within acceptable parameters, then best practices call for inspection of the running areas within the tools for excessive wear or damage. If the die has been running properly in production and the components have been properly assembled, it’s likely that the tool heads are properly aligned. If, however, the die is new and alignment has not yet been verified, improper alignment could be an issue. In order to verify, metalformers typically place modeling clay or some similar soft material on the end of the insertion tool, close the die, and then examine the impression made by the anvil to confirm alignment. If too many or too few fasteners are staged in the bowl, the feed system may run too quickly or too slowly. The amount of fasteners is controlled by a hopper sensor, which sets the high/low limit for the amount in the bowl. Camber in the stock strip also can contribute to positioning problems or low push out/torque out values. Proper alignment of guide rails and piloting in the insertion stations is essential for consistent quality. Operators should check accordingly for worn rails or pilots. In addition, if the station is not properly piloted, additional pilots may be necessary to hold the strip in position for fastener insertion, since some types of fasteners have little tolerance for misalignment. Once the fastener is inserted in the stock strip, proper insertion can be verified dimensionally and by conducting push-out and torque-out tests. When using clinch fasteners, conduct a preliminary visual inspection to, first, confirm that the fastener is properly seated and that the clinch features are fully embedded into the stock strip. Then verify the alignment of the fastener to its respective hole. It should be centered in the hole; if the strip is misaligned, the fastener will be off-center and, in extreme cases, the shank of the fastener may shear the edge of the hole. Off-center conditions will lead to low performance or damaged fasteners. The control system can be friend or foe. A well-designed and functioning control system will can serve as an ideal asset for troubleshooting a host of metalforming problems, including those centered on the in-die fastening setup. Controls with touch screens have become far superior compared with more rudimentary controls that rely on simple indicator lights as the operator interface. And while a more sophisticated control with a touch-screen operator interface can provide a host of operator and troubleshooting features, such as I/O (input/output) condition screens, the true value in everyday operation is the ability to provide online help. Properly configured and programmed, the technology allows for the display of troubleshooting text and graphics when a fault occurs. Information about the fault, how to correct it, and how to restart the system can be displayed in a variety of s and even in several different languages. This information can significantly reduce troubleshooting time and also can minimize the learning curve for new or inexperienced operators. Trial-and-error troubleshooting is avoided, so that the key process variables are isolated.